Liverpool are odds-on to book their place in the last 4 of the Champions League when they visit Manchester City tonight, but bookmaker Betfair is offering a HUGE 25/1 price boost for the Reds to qualify for the semifinals! Hurry up, you can claim this offer until the kick-off! Liverpool make the short trip to Manchester boasting a commanding 3-0 lead after a stunning first leg at Anfield. The Reds have won three and lost none of their five away matches in Champions League this year. Furthermore, Jurgen Klopp's men have kept a clean sheet in 6 of their last 7 European matches. Get 25/1 Liverpool to qualify vs Manchester City with Betfair (1st leg ended 3-0)! 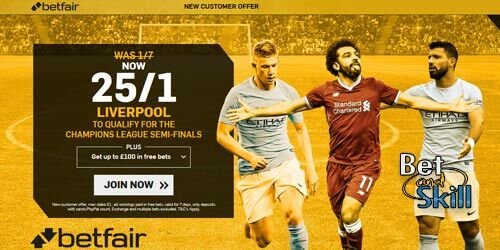 Register a new account with Betfair before the kick-off (7.45pm) and claim 25/1 Liverpool to qualify for the Champions League semifinals - What an insane price boost!! If Liverpool go through, Betfair will pay out at the quoted price immediately. They will top up your additional winnings within 24hrs. The Citizens have suffered back to back defeats (they lost 3-2 the Manchester derby last weekend) and have conceded 3 goals in each of these games. Betfair are offering all BetAndSkill readers a special price of 25/1 Liverpool to qualify for the Champions League semifinals, click here to get your crazy offer right now! New Customers can get Liverpool at an enhanced 25/1 to qualify for the UCL Semi Final. Max Stake £1. Winnings paid in free bets, valid for 7 days, only deposits with cards/Paypal count. Exchange and multiple bets excluded. T&C’s Apply. 18+|Gamble Aware. Maximum bet available at 25/1 is €/£1. Standard winnings are credited as cash based on the quoted price on Betfair website. All the deposit methods count (except Moneybookers, Paysafe, Neteller and Skrill). You can use credit cards or Paypal to claim this offer. "Get 25/1 Liverpool to qualify for the Champions League semifinals at Betfair (was 1/7)"